Living in the Ice Age: What is Paleo+? In the first instance, Paleo was an intention to understand an optimal human diet following the dietary principles of primitive man as it has been passed down through hundreds of thousands of years of evolution. As Paleo has developed, it has become more than dietary re-enactment and a number of Paleo writers have sought to modernise the approach; the food available to primitive man is NOT available to us today. So, we should take the principles of ancestral eating and take that forward. What is Paleo+? Plus what? Paleo+ holds the central tenets of the original Paleo diet as described by Loren Cordain and Robb Wolf, while embracing all manner of foods which do not disrupt human biochemistry and which the imbiber is not intolerant of. While meat, fish, shellfish and vegetables make a fulfilling and infinitely interesting diet, the inclusion of dairy and safe starches add further sources of quality macro-nutrients. I guess dairy was kicked out of the initial definition due to perceived intolerances by most of the population that was being considered. Once Paleo went global, huge and vast portions of the world showed themselves not to be intolerant, and even the scope of dairy opened up - sheep, goat, reindeer, buffalo; and huge and vast portions of the world showed that dairy was simply not an issue. Lactose intolerance aside, there is the secondary issue of A1 beta casein; a protein which has been implicated as a potential factor in diabetes mellitus, ischaemic heart disease and also as a modifier of behavioural symptoms associated with some neurological conditions such as autism. You will find that most of the cow milk that you encounter will be A1 type, from Fresian and Holsten breeds representing the majority of milk cows in Europe, the US and Australia. A2 type milk can readily be had from other species: sheep, goat, reindeer, buffalo; but there is hope for cow milk: Guernsey and Jersey breeds carry a very high incidence of A2 type milk. For real world eating, fermented and fatty dairy is safest from cow milk. You will find a lot of my food uses dairy ingredients, but you will not find milk in almost anything I cook. I use cream, yoghurt, soured cream, cheese and other fermented dairy. If you are truly intolerant, or just don't want to use dairy then skip it - the meal will be good without it! Goat milk, for instance, has a number of advantages over cow milk: lacking in agglutinin, naturally homogenised, greater concentration of digestive-friendly medium chain triglycerides, significantly lower levels of allergenic S1 alpha casein proteins and higher in all manner of vitamins and minerals including B2, B6 and A, niacin, calcium and protein. Moreover, rather than minimising the negatives by sourcing the best cow dairy, goat dairy can be considered to be actually positive, even healing for all manner of digestive disorders and thereafter promoting healthy digestion. Sheep dairy is practically identical to goat so sheep products should also be considered, along with buffalo. Mozzarella, anyone? In as much as Paleo is not a low carbohydrate diet (more that lower carbohydrate is more natural to the diet), Paleo+ is not edging towards a higher carbohydrate diet. Limiting carbohydrate intake to less than the glucose requirement of activity in order that any defecit will still be made up by gluconeogenesis is still core the principles of Paleo+ and care should be taken to understand the context of safe starches as sources of glucose. Kurt Harris, author of Archevore, considers these safe starches (with the exception of white rice) to be "whole food starch sources with good mineral and micronutrient content that have been eaten in good health for thousands of years in many environments by genetically diverse populations" ... "these starchy plant organs or vegetables are like night and day compared to most cereal grains, particularly wheat. One can eat more than half of calories from these safe starches without the risk of disease from phytates and mineral deficiencies one would have from relying on grains.". White rice is nutritionally uninteresting, providing a simple pack of glucose which is easily digested. 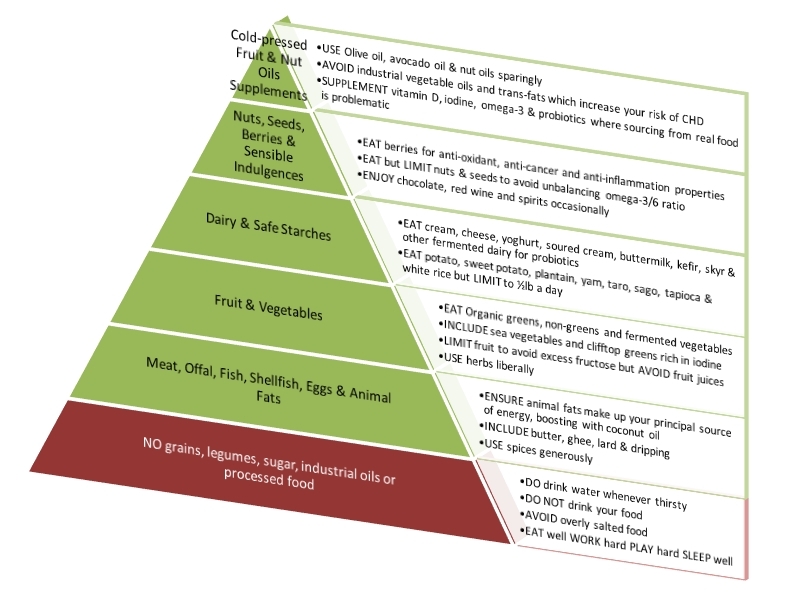 Paleo+ is a more balanced diet for metabolically sound people with a healthy body fat index. Balancing the fat, protein and carbohydrate macronutrients is more about quality than quantity. So, I just need to eat right? First, meal timing and frequency. Our ancestors did not have access to regular and abundant supplies of food. Their day was spent hunting, foraging and gathering. Breakfast would have consisted of leftovers from the night before, perhaps the morning find of eggs, but they'd get up and get on with it. Communal eating in the early evening was the purpose of the day. Try simple breakfasts of leftovers, eggs, perhaps some yoghurt and wild berries. Try to skip through lunch, perhaps with just a small snack of nuts or berries, maybe a piece of fruit; maybe a light salad with some fish. Prepare a really good evening meal, perhaps a few courses and really enjoy it, making the most of the meal time as a communal activity, passing, sharing, telling about your day, listening, talking, discussing amongst the family or friends. Eating right will go a long way to restoring your health and fitness, but you really do need to be active. This does not mean the gym, this means doing things that our ancestors would have: walking, running, sprinting, lifting. Walking every day for a couple of miles, whatever the weather is a good start. Get some suitable clothes and get out there in whatever the weather brings you! Find new routes around where you live. This can be urban, semi-urban, around a park or off into the hills if you live close enough. Get a longer walk at the weekend. Do consider minimalist, or even barefoot where practicable. Mix in running some days, occasionally sprinting ... all out, and certainly lift heavy things regularly. Weights? Could be ... could just be tyres, buckets of water, bags of sand, a steel girder, something unpredictable is fun. It could also be resistance bands. Whatever you choose to do, read up on it and get into it. We've worked, we've exercised, we're de-stressed and we've enjoyed a really good meal. Rest and relaxation is paramount. We can often feel guilty for doing nothing, but actively relaxing is very beneficial - watching animals in the fields, watching the wind in the trees, the snow falling, the leaves blowing; empty your mind and relax. Finally, we go to sleep. Absolute darkness with no digital interference is the best. Blackout curtains, an alarm clock which goes dark when not in use, putting your mobile phone in another room (and off overnight) and avoiding digital activity for a good hour prior to bed. So, why should I do this? The exercise is a no-brainer ... you get to be active, you get to enjoy your surroundings, you get to savour the weather, all weather, you de-stress and you keep fit. The food ... well, it's damn tasty for a start ... and it won't kill you, ultimately. The food I cook is for me and my family. It is good, wholesome food which is interesting and tasty, moreover, it satisfies and carries us from one meal to another without snacking. If you drop the "paleo" or "paleo+" tag, you're left with just good food.